This Chintaly Glass Curio Cabinet adds a chic, modern element to any living space.This curio contains three interior glass shelves for storage. 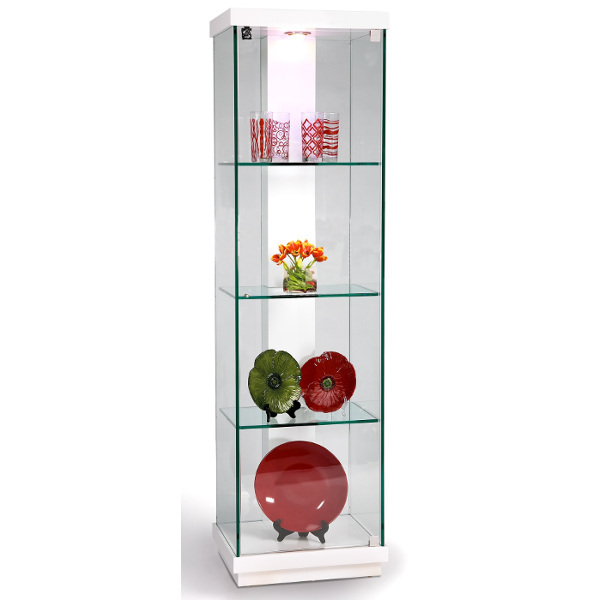 This curio cabinet also features an interior light for a luminous display and locks for secure storage. Tempered glass and metal construction and gloss white finish enhances chic, minimalist design. Built-in UL light highlights your pieces. Three (3) tempered glass shelves; locking glass door. About the Brand: Based in Farmingdale, New York, Chintaly Imports has been supplying the furniture industry with quality products since 1997. From its humble beginning with a small assortment of casual dining tables and chairs, Chintaly Imports has grown to become a full-range supplier of curios, computer desks, accent pieces, occasional table, barstools, pub sets, upholstery groups and bedroom sets. This assortment of products includes many high-styled contemporary and traditionally-styled items. Chintaly Imports takes pride in the fact that many of its products offer the innovative look, style, and quality which are offered with other suppliers at much higher prices. Currently, Chintaly Imports products appeal to a broad customer base which encompasses many single store operations along with numerous top 100 dealers. Chintaly Imports showrooms are located in High Point, North Carolina and Las Vegas, Nevada.